I'm going to get ripped for this post. I'm aware it's going to happen as I write this. I went to Target and picked up a $30 tin of 2009 Sweet Spot, my second of the year. The first one I didn't too terribly. I didn't get many Yankee base cards, but I didn't hate the hit. Then, I did a group Twitter break with Voice of the Collector. I hated the card I got there. It was so bad not even the Houston collector wanted it. I thought I would try my luck a third time. Third time's a charm ... heh. Well, I did get lucky. I smashed the odds that state there is supposed to be one jersey or autograph per tin. So, I opened the first pack and saw a Derek Jeter base card on top. Not a bad way to start. 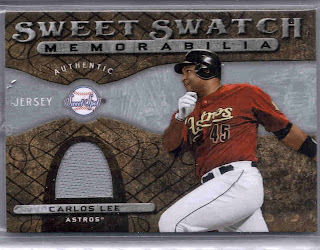 Then, I thought, I don't think the UD 20th anniversary game-used cards are real hits. I think they are extras. So, I probably have another. Next pack a Joba Chamberlain base on top. Cool. I open the third pack and peek at the card in the middle. I see it's another jersey. All I'm thinking to myself is "Wow. 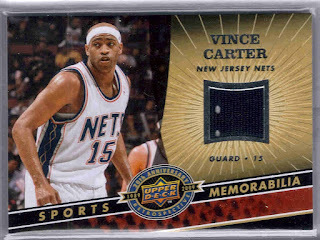 I can't believe I got three jersey cards." Yet, after all that I felt incredibly deflated. I smashed the odds and two out of three cards were Red Sox. The third was from a sport I haven't watched in five years, at least. RED SOX!! There ya go. I almost wished I saved the money from that tin. Now, go ahead and rip me. Also, I didn't know the 20th anniversary relics came in retail. That's like a case hit, isn't it? I sympathize. I think I'd feel the same way if I opened a tin and got Yankees or Phillies. No rips. I understand your dislike of the Red Sox. 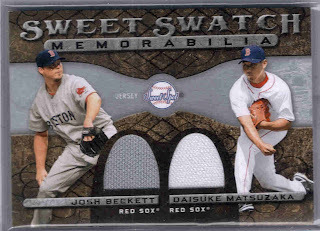 What I don't understand is your dislike of the Red Sox to the point that you don't seem to appreciate that you have a jersey card of a Hall of Famer. Two, but you don't hate the Carlton card. If that Yaz card is going to cause you problems, I'll see what I can scrape up in trade. WOW, looks you got my box. I will gladly take any unwanted Red Sox off of your hands. 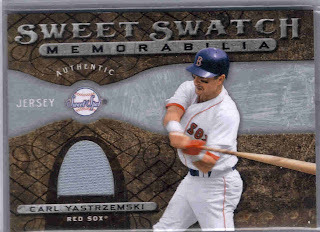 What would you like in return for the Yaz card? He hit a home run off my dad in the minors and caused my dad to give up pitching. So, I guess, in some weird way, I owe my life to Yaz. Name your price. I collect Jeter and Kouzmanoff. Also, I am willing to listen to most Yankee offers, but I collect mostly Pettitte, Posada and Rivera in that regard. I see no problem with those hits whatsoever. Now, that Joba base card...that could be a problem.